Although the modern sideband transceiver is a very complicated piece of equipment, it is not at all difficult to assemble the EICO 753 sideband transceiver kit. This transceiver has both PTT and VOX and the offset tuning allows you to move the receiver up to 10 kHz away from the transmit frequency. The engineering of this transceiver leaves little to be desired, and the step-by-step instructions are clear and easy to follow. At a time when so much amateur equipment is being bought factory wired, the bum who constructs his own from a kit can feel well satisfied. 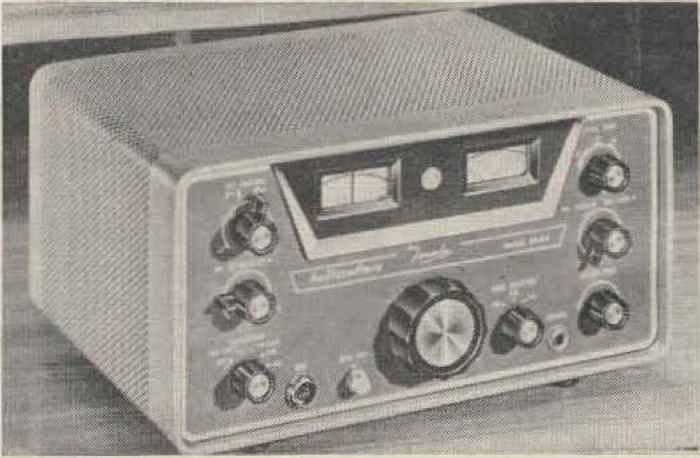 The full-band coverage of the 753 actually goes beyond the band edges: 3490 to 40 0 kHz, 6990 to 7310 kHz and 13890 to 14410 kHz with lower sideband on 40 and 80 and upper sideband on 20. The VFO is completely solid state and is verv stable for either fixed or mobile operation. Complete VOX is built in with the VOX threshold, delay, sensitivity and anti-VOX controls available on the rear deck. assembled version available for $299,95. i Ue new Galaxy V Mark 2 transceiver maintains all of the features of the old model, but adds some new things to make a very nice package better. 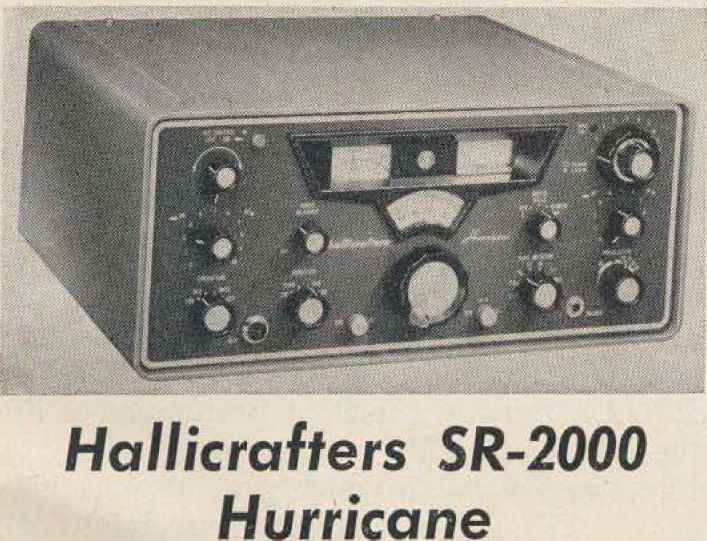 This new transceiver is rated at 400 watts PEP in SSB service, up 100 watts from the old model, has a new precise vernier logging scale that lets you interpolate accurately down to 50 Hz or sof a solid state VFO for improved frequency stability and drift and a built-in audio sidetone for the CW boys. In addition, there is a new CW filter and break-in option available if you want the maximum m CW operating convenience. The excellent sensitivity of the Galaxy V, less that 0,5 ¿A for 10 dB signal to noise ratio, and the extremely good shape factor of the if passband provide very good results on om crowded bands. 1 he dual attack and release AVC make the receiver virtually block proof. For increased power and minimum flat-topping and distortion, the internal ALC circuit provides up to 10 dB of compression. This unit is lightweight and compact, and is an ideal choice for mobile operation. For mobile use? the G35A DC supply furnishes all the necessary voltages; for fixed station use, the AC35 AC power supply is available. Other accessories which are available are a remote VlrO for working stations off your transmit frequency, a deluxe accessory console which has a built-in speaker> phone patch, SWR bridge and 24 hour digital clock, a speaker console which has provision for mounting the AC power supply, and several accessories for mounting the Galaxy V Mark 2 in vour car. 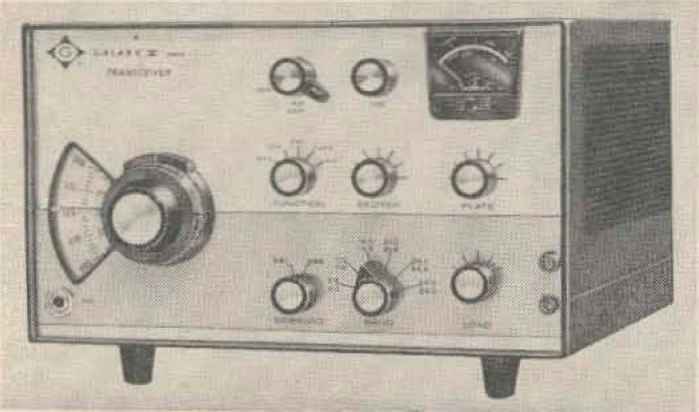 1 he 50(n watts PEP input of this transceiver provides an excellent account of itself when run 'barefoot." The transceiver incorporates Hallicrafters exclusive Amplified Automatic Level Control (AALC) to prevent splatter and final amplifier flat-topping. In addition, the receiver section contains Receiver Incremental Tuning Control (R1T) which allows the operator to tune the receiver up to 3 kHz to either side of the transmitter frequency. All jacks and switching for linear amplifier operation are included as well as a combination S-meter/RF output indicator. 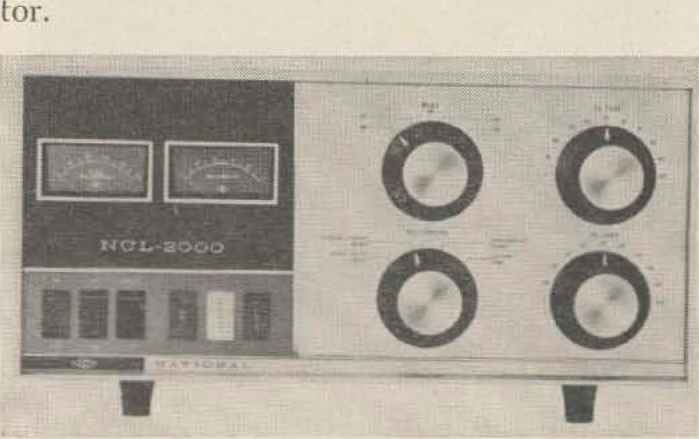 2 kHz between the 100 kHz points when used with an optional crystal calibrator. lie stability of the YFO is excellent, and is stable to within 300 Hz after warm up. Accessories available for the SR-500 include the 11 A-16 VOX adapter, the P-500 AC power supply for fixed station operation and a P-500 DC power supply for mobile operation from a 12.6 volt DC power source. For mobile installations the special MR-160 mobile kit is available which includes all the inter-connecting cables. (AALC), built-in VOX plus CW break-in and PTT. I ■ xe use of double tuned circuits and steep sided crystal filters results in improved spurious signal rejection and carrier suppression of SO dB, unwanted sideband suppression of 50 dB and 30 dB suppression of the 3rd and 5th distortion products. 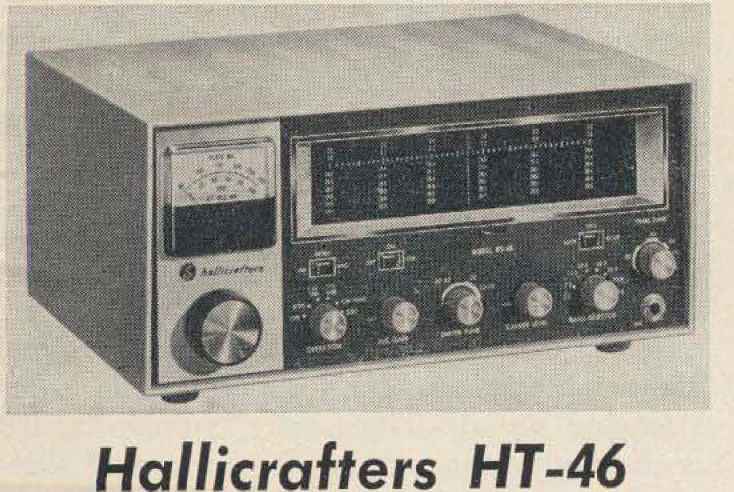 The Hallicrafters HT-46 SSB/CW transmitter provides a potent input power of 175 watts PEP on SSB and 150 watts on CW, [t is outstanding as a separate transmitter with a self contained AC power supply, but its extra versatility is shown by the trans-ceiving capability provided for use with the matching SX-146 receiver. 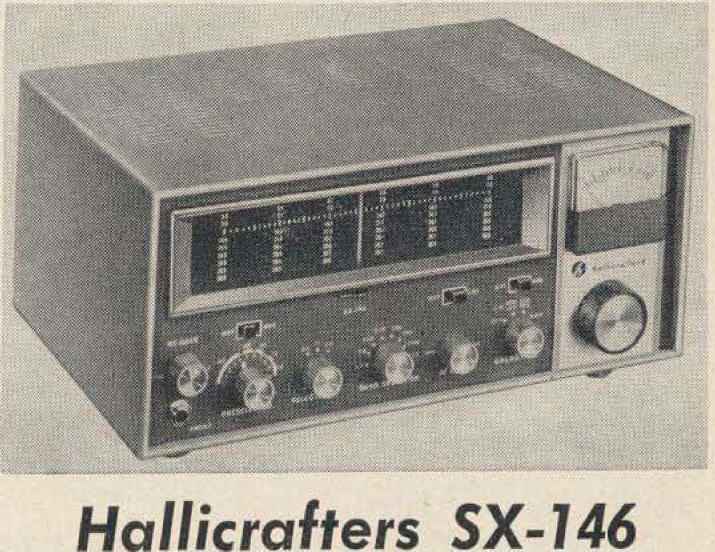 In addition, it may be operated separately from its own internal VFO, Physically it is the same size and appearance as t\\e SX-146 receiver, so it makes an ideal companion to it.